These lines from the Bhagavadgita epitomize the essence off Corporate Social Responsibility. CSR is not new in India, many companies like TATA and Indian Oil have been contributing towards the society before CSR was defined. In the initial phase it was a running trend among corporates to indulge int CSR activities and use it as a merely as a smart marketing gimmick. However, over the years the trend has shifted from focusing solely on making a profit and companies have realised that what is good for employees, shareholders, environment and society is good for business! CSR is a very wide topic and has been defined by many organizations but the most apt definition is by the World Business Council, “Corporate social responsibility is the continuing commitment by business to contribute to economic development while improving the quality of life of the workforce and their families as well as of the community and society at large”. Thus, corporate social responsibility is a twofold concept wherein a firm has to take care of business ethics when it comes down to the stakeholders of the company as well as a firms accountability towards the society at large. Although India is a rapidly developing country in terms of socio-economic development, it still has ingrained problems like illiteracy, lack of health care, environmental issues etc which need to be addressed. Companies have been investing a huge chunk of their reserves in CSR activities and are contributing towards the social well being of the economy. These activities in many cases are inclined towards upholding clearly defined laws and acts by the government, for example: Child Labor and Right to Organization, Right to information and Corruption, Environment, Labor laws etc. Employees form the very backbone of these programs and take active participation in CSR efforts even on holidays. This is mainly because companies are having dedicated departments for their CSR activities. These days companies are adopting entire villages and giving their CSR programs a holistic approach. They take care of health and sanitation, education, unemployment and infrastructure facilities for these underdeveloped villages. Some companies also initiate their CSR activities through partnerships with NGO’s that focus on certain social issues and are well versed with the problems faced by villager. Kumar Builders has also initiated an extensive sustainable development program for the society by focusing on education, slum rehabilitation and environmental issues. We have introduced a unique project for slum dwellers in the Erandwane-Kelewadi area under the slum rehabilitation project as per the Slum Rehabilitation Authority (SRA), scheme launched by the state government. We are constructing a 2BHK semi-furnished apartment of 269 sq ft carpet area for slum dwellers. We wish to create decent living conditions for slum dwellers so they and their children can have a good future and also have a firm roof above their heads. In addition to this we have a talent harnessing project called Gunvatta Vikas Yojana which is in action since 10 years in memory of late Shri. Kesarimalji H.Oswal for around 6000 students and 500 schools across Maharashtra. Our aim is to create confidence in under privileged students through an over all development of their skills so that they emerge as the thought leaders of tomorrow. Kumar builders also believes in supporting environmental programs wherein every year our employees plant around 1000 saplings and participate in clean city drives so that we do out bit and help fight against global warming. CSR has come a long way in India and companies are taking some serious efforts towards sustainable development of the society. Today it’s difficult for one single entity to eradicate all social issues at one go. Corporates have the financial reserves, expertise and manpower to execute these activities and bring a revolutionary change in our society. Thus indulging in these activities and crafting social development will only add to the good of the company and society at large. 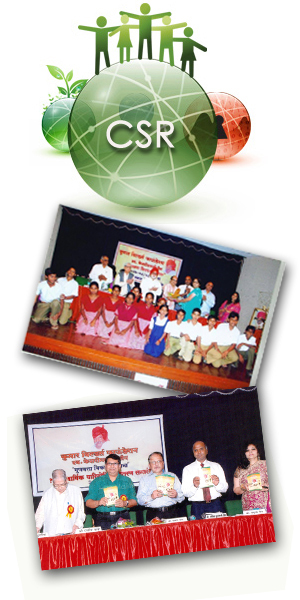 “Gunwatta Vikas Yojana” formerly known as Adarsh Vidya Mandir was started by its founder Shri Lalitkumar Kesarimal Jain Chairman and Managing Director of “Kumar Urban Development Limited” (KUL) in the memory of Late Shri Kesarimalji H. Oswal with the sole purpose of Education as a core, a social cause and a pure intention of promoting education in the rural areas of Maharashtra and uplifting the standard of students in the rural areas by conducting various activities. The idea was inspired by Prof. Shri. P. D. Puranik the Headmaster of S.M.Joshi Vidyalaya, Pune along with a expertise team of well educated dignitaries from the field of education who have created benchmarks and have always exceeded their commitments in whatever they do. The said team included Prof. Late Shri. P. G. Vaidya and Prof. Late Shri Jayant Tribhuvan who have contributed in a big way for the success of Gunwatta Vikas Yojana. The current team includes Prof. Shri P. D. Patil and Prof. Dyaneshwar Bhanage who are working hand in hand with Shri. P. D. Puranik to ensure that the purpose of Gunwatta Vikas Yojana is met in all what they do. We are proud to say that “Gunwatta Vikas Yojana” has completed its successful journey of 10 years i.e. a decade since its establishment in the year 2000 and since that day there has been no looking back. It merely started with few schools in the rural areas and today has to its credit over more than 200 schools in the rural as well as in the city of Pune. Gunwatta Vikas Yojana has been successful in spreading its wing to cater to the needs of education for the students in the rural areas of Purandar, Maval, Mulshi, Bhor, Haveli and Pune City. Since the year 2000 working hand in hand Gunwatta Vikas Yojana has been successful in achieving 100% result in more than 20% of the schools. Now, more importantly what has actually transpired out the yojana is more interesting that the students’ interest in studies has increased to a great extent and at the same time the grasping power of the students has drastically improved which is one of the great achievement of the Yojana which was one of the sole cause of Shri. Lalitkumar Jain to implement the Gunwatta Vikas Yojana. One of the facts is that there are always students who are weak at studies in every school and this yojana has helped the said students to improve in a big way. The Yojana has been designed in such a way that a group is formed of 8 to 10 students which includes the students who are poor in studies and the bright students share their knowledge and wisdom and their way and pattern of studies with such students which have resulted in their overall development. It has also helped them in increasing their will and thinking power to a great extent thereby improving their academic results. Students who never spoke in front of few people today can speak in a big crowd of hundreds which has resulted in eliminating the stage fear of the students. This further resulted in reducing the workload of teachers where they can concentrate on other development of the students and school and further provide quality education to all the students. Annual gatherings are organized by the Gunwatta Vikas Yojana and winners are distributed gifts like Dhol, Tasha, Harmonium, Lezim, Zanjha, Tabla and many more. Sports day is also organized by the Gunwatta Vikas yojana for all the schools periodically. The teachers of all the schools are called together or group wise and the entire Gunwatta Vikas Yojana with its purpose is explained to all the teachers so as to make them aware of the intention and purpose of the Gunwatta Vikas Yojana in order to strive hard to achieve 100% result. This is done thrice in a year. The Gunwatta Vikas Yojana also helps in developing the personality of the students by guiding them in various aspects of life, may it be in school or at home such as cleanliness in the surrounding, respect for elders, overall behavior in school or in public whenever they move around in a mob, manners and etiquettes, lessons on Unity. We at Kumar Builders stand firm by our motto, “We Build trust.” The same is being followed in doing our corporate social responsibility. KUL is an accredited ISO 9001: 2008 organization and is among the first Construction Companies to obtain an ISO 14001: 2004 Environmental Certification, proving our commitment to a greener healthier environment. A step ahead, being safety & health conscious, we are also an OHSAS 18001: 2007 certified company. Workers are steel nerves of construction industry. To ensure their physical and mental health & safety of the workers, good accommodation is provided at site as also hygienic drainage facility, pure and potable water supply and electricity supply is provided. Also for the safety of children of labours working on site and also with the purpose of educating them, mobile creche is provided at sites. The children are taught poems, alphabets, drawing, craft, making sculpture, paper bags, etc. Other than providing mobile creche at all sites for educating children of construction workers, KUL has started with Adarsh Vidya Mandir Yojana in 2001 for below average students. 200 schools have enrolled in these 5 years from Pune and Haveli Taluka. The focus of this Yojana is mainly on rural areas and to integrate group of intelligent students with intellectually average or below average students. The intelligent students will teach intellectually below average students during lunch hours or after school hours. Since this programme is carried out, the results can be seen by increase in percentage of passing students.